View either our live feed or select the time lapse from the previous day by using the menu option in the top right corner of the video play area. Our cameras run 24 hours a day and automatically updates every 5 minutes with a new image (based on our current connection). Our system is one camera per location which pans to different areas based on the location presets which we select. 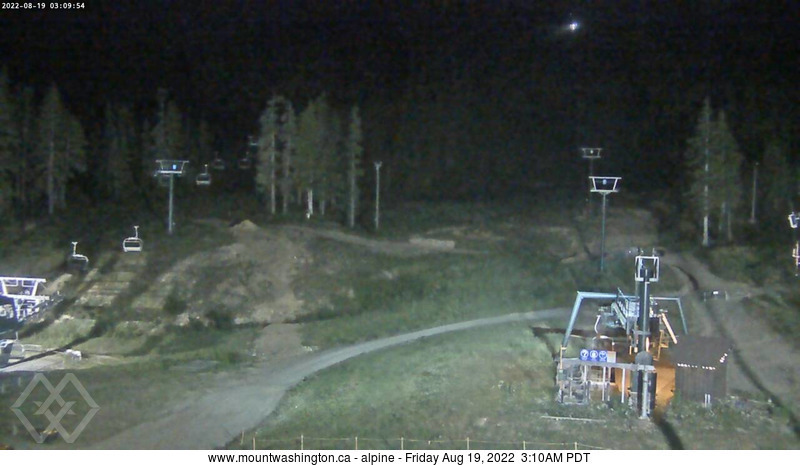 Mount Washington Alpine Resort’s policy is to show images that show something that is clearly visible for this location. Occasionally weather conditions will prevent us from showing more than one or two images due to obscured views. The image presets are reviewed every morning during our morning snow reporting procedures and reviewed throughout the business day as needed. For peak views and conditions, please refer to our Eagle cam. The dome enclosure is heated so most snow that hits the dome melts and appears to be rain when it is in fact snowing. Under windy conditions (with wind chill), occasionally the condensation will freeze on the outside of the dome. In storm conditions it is not always possible to keep these cams operating and viewable. The enclosures are not equipped with wipers or other self-cleaning devices. Please refer to the Alpine Snow Report for detailed weather conditions.